Chef Kat and Mike are part of the Flights of Chardonnay CRU on Friday, July 20th. 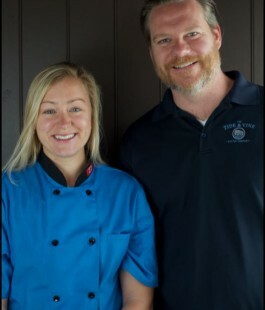 Owners and operators Mike Langley and Kat Steeves appropriately met in an Oyster House far far away. Their passion for Niagara wine along with their experience with seafood revealed an obvious pairing. They packed up their Toronto condo and literally hit the road to take up residence in Mike’s hometown of Niagara Falls. The Tide and Vine Oyster Company quickly made a splash at wineries, Farmer’s Markets and weekend events. Chefs, foodies and local supports quickly created a buzz about this new and unique company’s way of bringing seafood to the consumer rather than hoping to be found. Find Tide and Vine on Facebook, Instagram or CLICK HERE to visit their website.